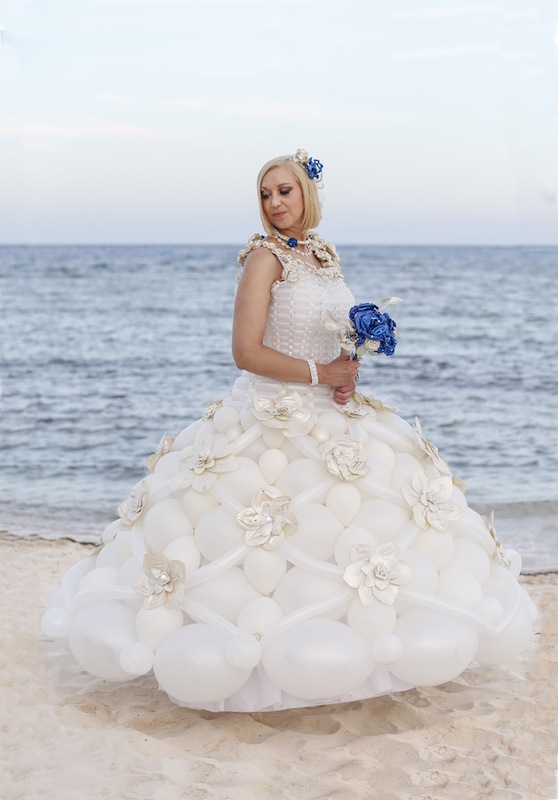 Balloon Wedding Dresses: A Daring Fashion Statement Or A Unique New Take On Tradition? 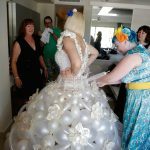 Nearly 1000 balloons were used to created this unique balloon wedding dress. 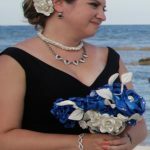 Designing balloon wedding dresses (and balloon wedding décor) is always a fun process for me –working with Chuck Lane and Julie Trygar on their wedding in Riviera Maya, Mexico was no exception! 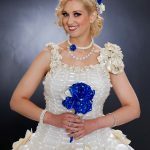 Collaborating with Julie in designing her dream balloon gown, going through the creation process(using roughly 1000 pearly white and blue balloons) and finally watching the gown come to life as Julie wore it was a truly rewarding experience! 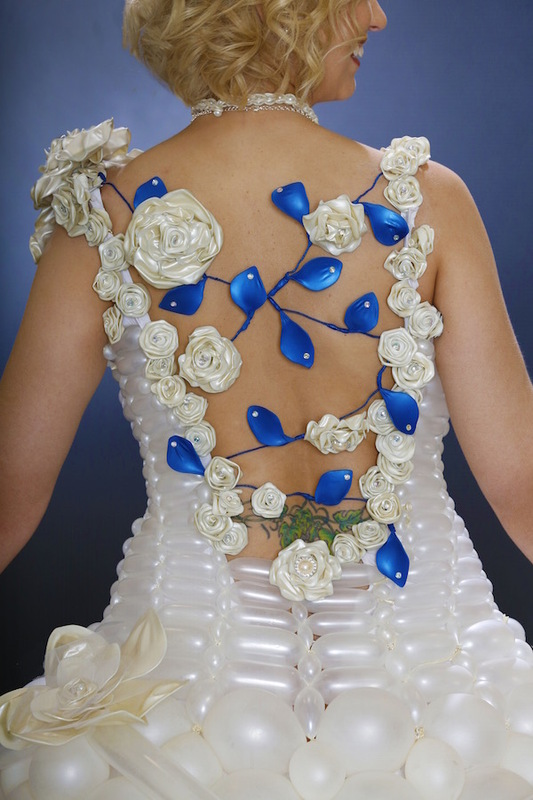 The back of the dress was made using non-inflated balloons wrapped around wires. 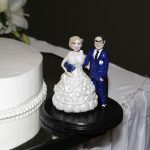 Chuck and Julie’s wedding was the perfect example of just how much fun, joy and amusement balloon attire can bring to absolutely any occasion, no matter whether you’re looking to make a loud statement with whimsical balloon costumes and decorations or whether you’re looking for a more traditional look with a personal touch! 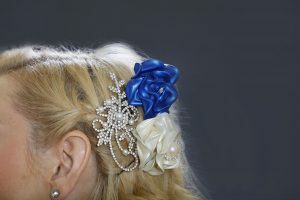 The hair pin was made using non-inflated balloons wrapped around wires. 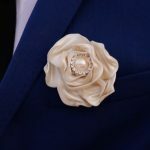 The bouquets, boutonnières, and jewelry were all made from balloons. Taking a modern approach to an ancient tradition. 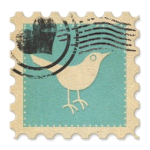 Wearing specialized wedding attire is a tradition that transcends cultural/geographical boundaries. The white wedding gown in particular, shot to fame in the 1840s when Queen Victoria wore one in her wedding to Albert of Saxe-Coburg. 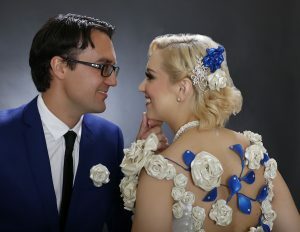 Ever since then, there have been endless designs, styles and materials used to create unique wedding gowns that would not only match the fantasies of each individual bride, but that would also stand out from the crowd. 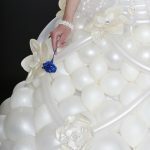 I believe balloon wedding gowns make a unique, modern contribution to this age-old tradition. 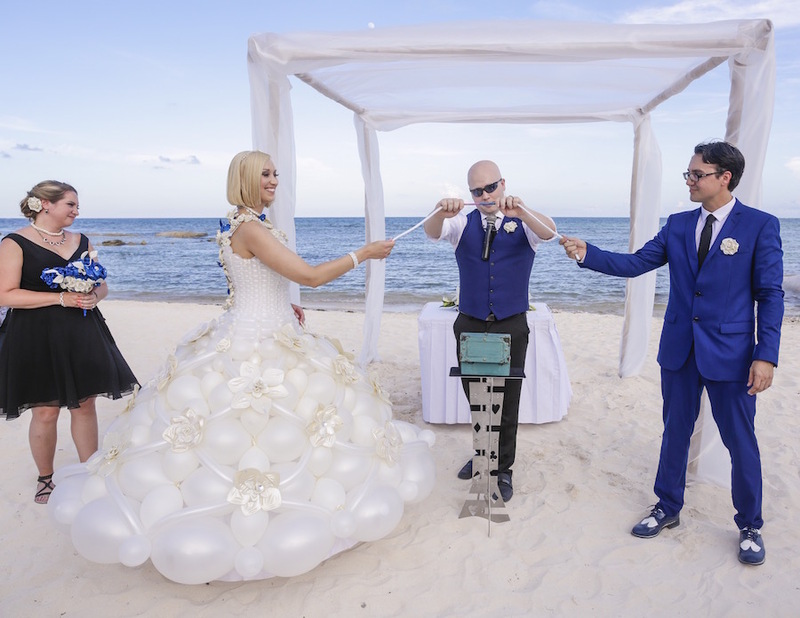 Thanks to the flexibility of balloon art and of balloons as a workable material, I’m able to take each bride’s distinctive vision and turn it into a fabulous balloon reality! 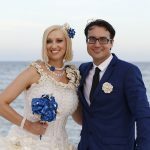 The couple perform a magic trick to “tie the knot”! 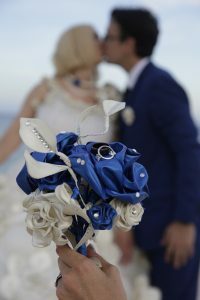 When it came to Julie’s dress, in addition to using inflated balloons, I used non-inflated balloons to create the intricate design at the back of the dress, as well as the flower accessories (these balloons were wrapped around wires to make the patterns more stable and durable). 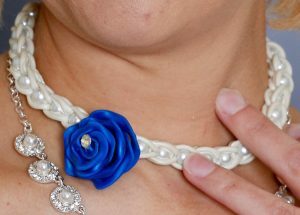 Both the dress and the accessories (the necklace, bouquets, boutonnieres and hair pins) were made several days in advance in order to give the artist Darcy Prevost enough time to create a cake topper that looked like the wedding dress, and to allow for the bride and groom to have a one-of-a-kind photo-shoot (in which the groom was featured in a balloon tux) that showed them having fun sword-fighting in their balloon attire! 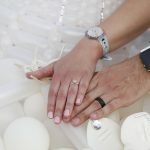 Everything from the elaborate balloon dress to the toss bouquet that was made out of 30 balloon bracelets (so that each guest could have one at the end) gave the event a more personal feel and provided an amusing twist on tradition. 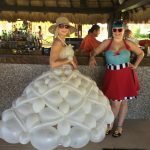 Although balloon wedding dresses may sometimes seem like daring fashion statements (especially considering the elements such as those in Riviera Maya), it’s worth noting that none of the balloons actually popped – using high quality balloons and employing the right techniques can really make all the difference! 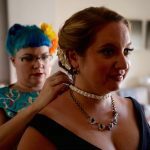 While balloon dresses, costumes and decorations can’t last forever, the wonderful memories of the fun and joy that they bring to any event are truly timeless!